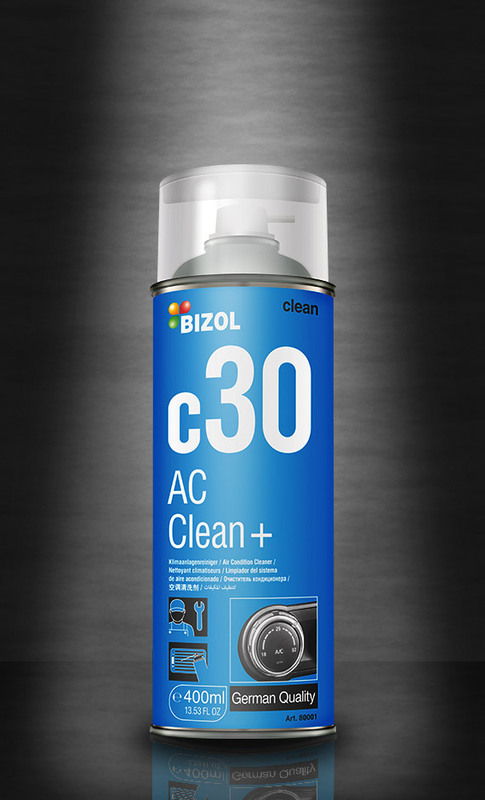 BIZOL AC Clean+ c30 effectively cleans the home and vehicle air conditioning systems. It has a fresh and subtle orange scent as well as a long lasting smell protection. We recommend cleaning the air conditioning system every 6 months. Special adapter enclosed. Spray it into the Air Conditioning inlet. BIZOL Brake Clean+ c31 has excellent dissolving properties. It leaves no residue and is non-conductive and non-corrosive. It has a powerful jet spray and because of its special spray head it can be used upside down. Spray on drum brakes, disc brakes, brake linings, brake callipers, brake shoes. The aerosol should have room temperature. Best processing temperature 5 to 30°C. Before use, shake the aerosol. Cover lacquered and plastic parts. Spray parts until the contamination has disappeared. Contaminated brake cleaner should be regarded as chemical waste. 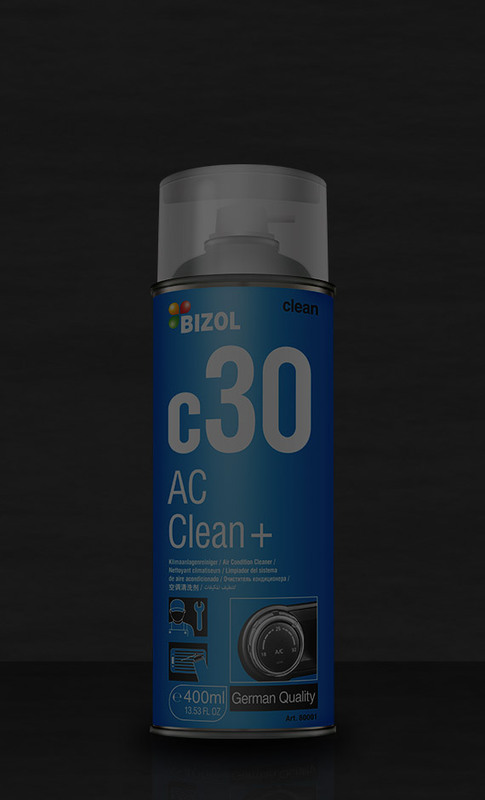 BIZOL Contact Clean+ c32 is a spray with high dissolving properties to clean electrical contacts. It is non-conductive and non-corrosive and leaves no residue. It has a powerful jet spray and because of its special spray nozzle it can be used upside down. It comes with an additional spray nozzle and an extension tube in the cap. Spray on switches, batteries, contact points, printed circuit board switches, multiple sockets. The aerosol should have room temperature. Best processing temperature 5 to 30°C. Before use, shake the aerosol. Switch off electrical installations before treatment. Spray the parts to be treated until the contamination has disappeared. Contaminated contact cleaner should be regarded as chemical waste. Only switch on the electrical installation after evaporation of the solvent (minimum of 15 minutes). BIZOL Cockpit Clean+ c33 cleans, protects and embellishes the dashboard and other plastic parts inside your car. This silicone free spray has excellent cleaning properties; it is antistatic and dirt repellent and gives a long-lasting gloss. BIZOL Cockpit Spray has a subtle orange scent. Spray on a clean cloth and apply on dashboards, bumpers, plastic parts, vinyl parts, spoilers, trims. The aerosol should have room temperature. Best processing temperature 5 to 30°C. Before use, shake the aerosol. Apply on a dry, clean cloth and distribute evenly over the surface to be treated. Then, polish with a dry cloth until a gloss has been achieved. Avoid contact with the steering wheel and operating pedals in view of reduced grip. BIZOL Multi Clean+ c34 is an effective universal cleaner that removes non-polar and polar contaminations from treated and untreated metal parts and various types of plastic. It has high dissolving properties and leaves no residue, is non-conductive and non-corrosive. It comes with a Cobra jet spray head that can be used upside down. Spray on bearings, machine parts, gear wheels, garden tools, locks, garden furniture, rails, windows, fastenings, axles. The aerosol should have room temperature. Best processing temperature 5 to 30°C. Before use, shake the aerosol. Before treatment, cover conductive parts and switch off electrical installations. Spray the parts to be treated and allow to take effect. Remove persistent contamination using a brush. Repeat the treatment till the contamination has disappeared. Contaminated industrial cleaner should be regarded as chemical waste. Unfortunately we don't have any distributors in your area. Please contact us directly. 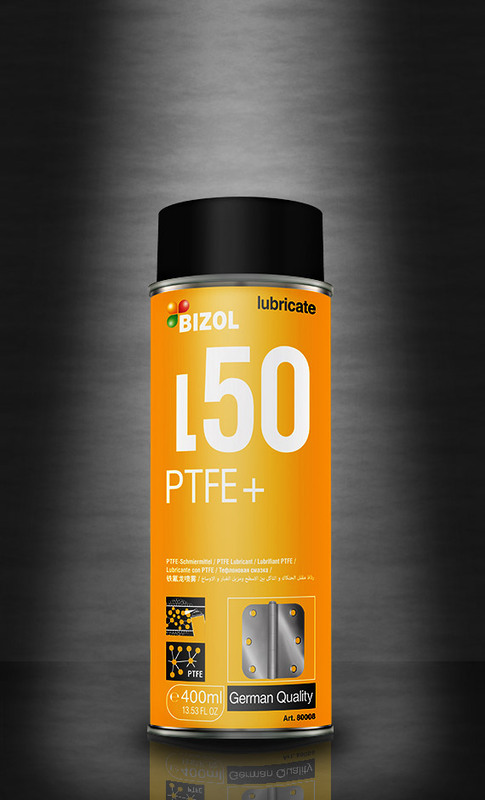 BIZOL PTFE+ L50 is a universal spray with outstanding mechanical and thermal stability to treat metal and plastic parts. It has a very low friction factor and excellent adhesion. It is weather resistant and pH-neutral; It comes with an additional spray nozzle and an extension tube in the cap. Spray on various types of machinery components that need effective lubrication working under high temperatures and mechanical stress. The aerosol should have room temperature. Best processing temperature 5 to 30°C. Before use, shake the aerosol. Apply the PTFE oil in a thin layer. The optimum lubrication is obtained after evaporation of the solvent. BIZOL Silicone+ L51 is a spray to lubricate and protect plastic or rubber parts. It is moisture repellent, pH-neutral and weather resistant. It prevents freezing and drying out of rubber parts and creaking and squeaking of plastic parts providing outstanding mechanical and thermal stability. It comes with an additional spray nozzle and an extension tube in the cap. Spray on door seals and rubbers, creaking plastic parts, dashboards, bumpers, sunshine roofs, rails (caravan, blinds), sliding doors, saw blades, moulds. The aerosol should have room temperature. Best processing temperature 5 to 30°C. Before use, shake the aerosol. Apply silicone spray in a thin layer. Optimum lubrication is obtained after evaporation of the solvent (approximately 1 minute). BIZOL Grease+ L52 is a high viscosity white spray grease with excellent adhesion to lubricate mechanical, metal or plastic parts. It has outstanding mechanical and thermal stability and is weather resistant. It is moisture repellent, pH-neutral and dirt repellent. It comes with an additional spray nozzle and an extension tube in the cap. Spray on metal to metal connections, roller bearings, metal to plastic connections, sliding bearings, door hinges, ball bearings, springs, shock absorbers, stabilization rubbers, worm wheels. The aerosol should have room temperature. Best processing temperature 5 to 30°C. Before use, shake the aerosol. Apply the White grease in a thin layer. Optimum lubrication is obtained after evaporation of the solvent. BIZOL Chain+ L53 is a spray to lubricate chain-driven transmissions under exceptionally high strain. BIZOL Chain Grease can be used like oil with the properties of grease with outstanding mechanical and thermal stability and is dirt repellent. It is weather resistant, hydrophobic and pH-neutral. It comes with an additional spray nozzle and an extension tube in the cap. Spray on chains, heavily loaded chain drives, conveyors, bicycle chains. The aerosol should have room temperature. Best processing temperature 5 to 30°C. Before use, shake the aerosol. Apply industrial chain grease in a thin layer. During the initial flow phase, when the spray can really penetrate the treated chain, the spray has a foaming effect. Optimum lubrication is obtained after evaporation of the solvent. 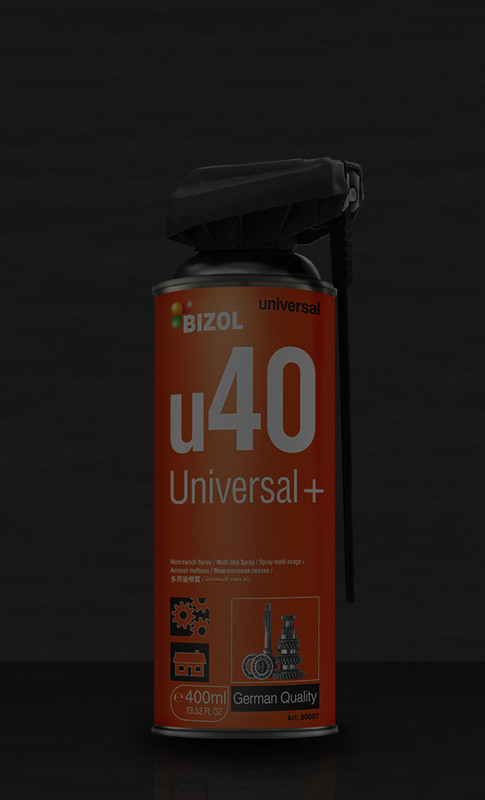 BIZOL Copper Clean+ L54 is a spray with a high copper content to prevent wear and sticking of screwed connections which are exposed to very high temperatures. It has a high thermal stability, prevents corrosion, is dirt repellent and weather resistant. It comes with an additional spray nozzle and an extension tube in the cap. Spray on brake parts, exhaust parts, battery poles, spark plugs, screwed connections, or parts exposed to high temperatures. The aerosol should have room temperature. Best processing temperature 5 to 30°C. Before use, shake the aerosol. Apply copper grease. The specific lubrication property is achieved after evaporation of the solvent (approximately 1 minute). 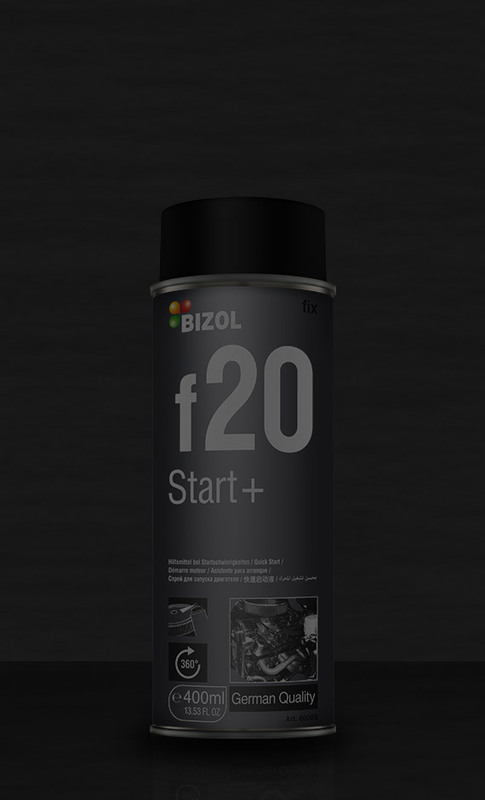 BIZOL Start+ f20 is a spray to eliminate starting problems of internal combustion engines. It comes with an additional spray nozzle and an extension tube in the cap. Inject it in the inlet of the air filter for several seconds and then start the engine. It is suitable for diesel and gasoline engines. The aerosol should have room temperature. Before use, shake the aerosol. Inject quick start into the air inlet ofthe air filter for several seconds. Start the engine. Please follow the operating instructions of the vehicle and engine manufacturers. 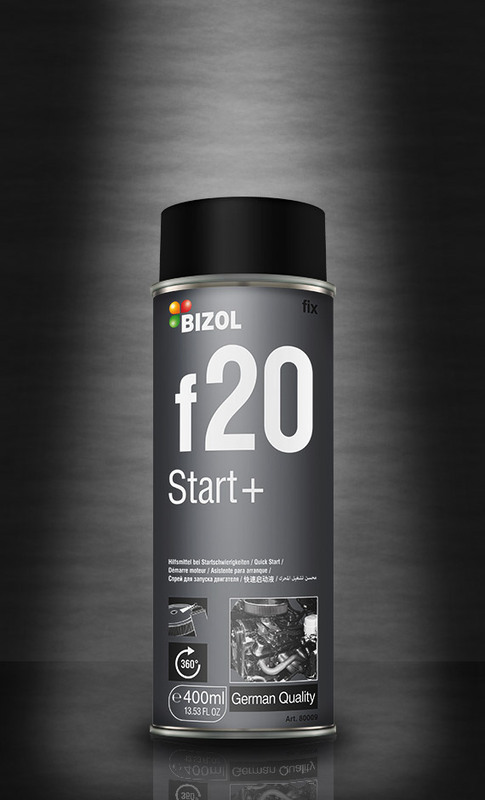 BIZOL Unblock+ f21 is an effective tool to unscrew rusty parts. It has excellent penetrating properties, contains graphite and MoS2 and is moisture repellent and rust preventive. 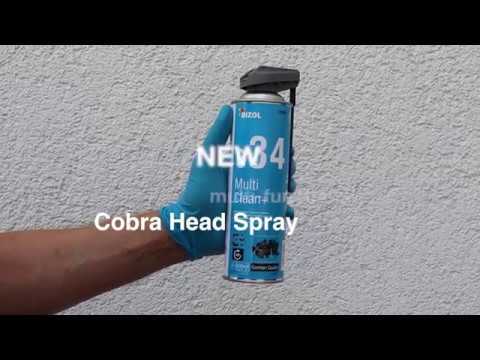 It has a powerful new Cobra jet spray which is particularly effective in reaching inaccessible places with the right dosage. Spray on fastenings, tools, screwed connections, rails, gear wheels, chains, locks, garden tools, screws, bolts and nuts, reels. The aerosol should have room temperature. Best processing temperature 5 to 30°C. Before use, shake the aerosol. Apply the product and allow it to take effect. 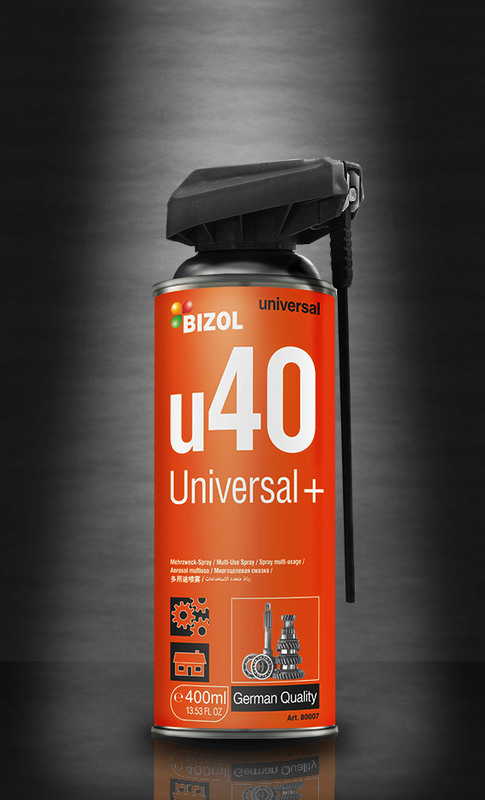 BIZOL Universal+ u40 lubricates, protects and cleans metal and plastic parts. It has good penetrating and cleaning properties. It is damp-resistant and rust preventive; it removes oil, grease, wax and tar and leaves a protective film. 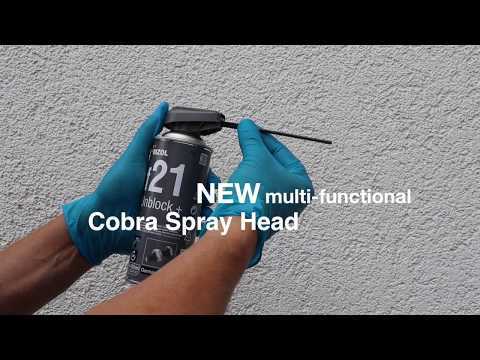 It comes with a Cobra jet spray head for improved application accuracy. Spray on battery poles, screws, bolts, nuts, nails, antennas, electrical connections, plastic and metal parts. The aerosol should have room temperature. Best processing temperature 5 to 30°C. Before use, shake the aerosol. Apply multispray in the desired quantity. The optimum lubrication is obtained after evaporation of the solvent.